Summary: The performances, by an international cast, are outstanding, and the film succeeds entirely in presenting this visually stunning and utterly strange world. Phew! I moved house this weekend and am pretty knackered. Also I have superglue all over my hands. Any tips on getting it off gratefully received. To celebrate being a grown up (ie in debt to the bank forever) I went to Ikea, and have just scoured limescale off the sink. Woohoo! Still, there’s always time to catch up on a review or two. Mongol (a slightly unfortunate title) is the story of the young Genghis Khan, and was nominee for this year’s foreign language Oscars, and is proof that the rise of Russian cinema does not rely on that idiot who directed Nightwatch. Its also a lesson in epic filmmaking for directors as varied as Oliver ‘Alexander’ Stone, Ridley ‘Kingdom of Heaven’ Scott, and Wolfgang ‘Troy’ Petersen. Watch and learn boys, watch and learn. A small group of warriors rides across the steppe, led by Esugei (Sen), on a mission of diplomacy to the Merkit tribe. Years ago Esugei stole a woman from the Merkit; now he comes to sue for peace, proposing an alliance with the Merkit through the marriage of his nine-year-old son Temudgin (Odnyam Odsuren) – son of the woman he stole. So they come to choose Temudgin’s bride; at the camp he meets Borte (Bayartsetseg Erdenebat), a confident ten-year-old who immediately captures his attention. He chooses her, and gives her a wishbone as symbol of his dedication. The mission, however is less successful; on the way home Esugai is poisoned by enemies, and dies in Temudgin’s arms, and his inheritance is stolen from him by Targutai (Mamadakov), a warrior who has always resented Esugai. 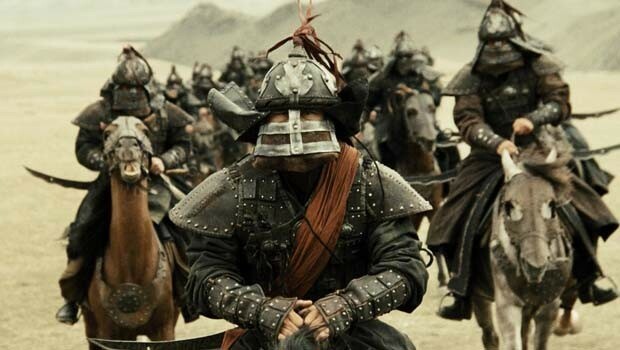 Targutai steals the dead khan’s horses and livestock, and threatens top murder Temudgin once he is grown to manhood. Temudgin realises that, for his family’s sake, he must go into exile; alone, and without a horse, he faces a bleak future. But luck is with the boy; he is found by Jamukha (Amarbold Tuvshinbayar), a young princeling, and the two become fast friends. But soon Temudgin is found and captured by Tartugai, who keeps him yoked in a cage. Somehow he survives, escapes, grows to manhood and, despite Tartugai’s pursuit, manages to evade him. Finally he finds a horse, and goes in search of Borte (Chuluun), now a lovely young woman, who has never forgotten him. She greets her betrothed (Tadanobu) joyfully, and together they ride to find Temudgin’s family, setting up their own camp on a plateau near his mother’s yurt, and it seems Temudgin has a chance of happiness at last. Mongol is a real eye-opener; a beautiful and well-made film that also opens a window on a world of which I was almost entirely ignorant. Genghis Khan was born in 1162, yet Mongol shows a world of paved roads, multistory buildings and civilised cities not seen in Europe since the fall of Rome. Of course the Mongols were also a warrior culture; it’s not all poetry and road building, but the relationship between Temudgin and Borte is shown as extremely progressive even by our standards. Though as the Great Khan he took hundreds of wives, Borte was the love of his life and a trusted advisor, and theirs was a true partnership. The performances, by an international cast, are outstanding, and the film succeeds entirely in presenting this visually stunning and utterly strange world. Also I noted with approval Borte’s hats; perfect for skiing.